Alternative media mogul Alex Jones—one of the most prominent opponents of the New World Order, “scientific dictatorship,” and the secret society that controls the police—has come a long way since he started his first radio show at KJFK in Austin, Texas. 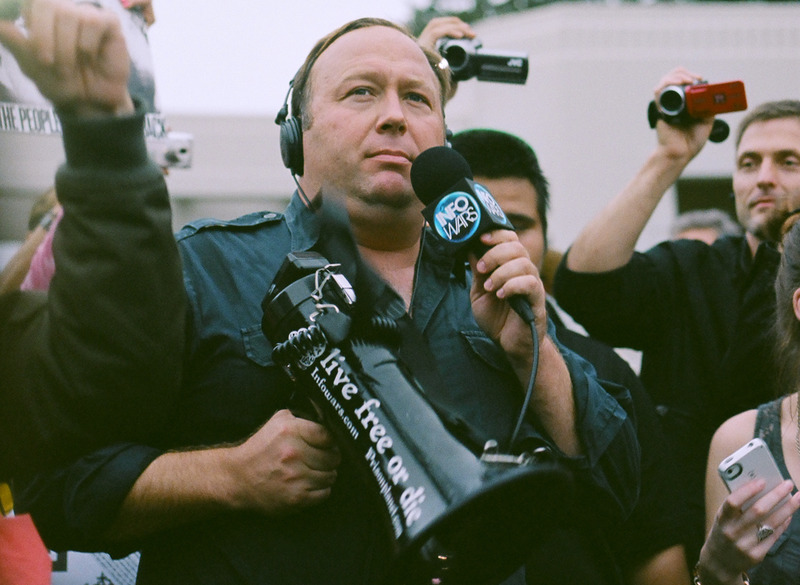 The Alex Jones Show, which peddles far-right and libertarian leaning political and social views to its emotionally-invested listeners, is syndicated on over 160 AM and FM stations across the country, carried by the America’s Talk channel on internet radio juggernaut iHeartRadio, and distributed as a popular podcast on iTunes. His website Infowars, which runs various news stories and serves as a hub for his show, gets around 6 million unique visitors per month, according to web analytics firm Alexa. “Infowars Life: Because there’s a war on for your life,” reads the tagline. The Infowars Store first appeared online in 2006, when Jones started selling a few books and other products. It now sells an impressive range of products, from books with titles like Bloodlines of the Illuminati and Controlling the Human Mind, to doomsday prepping gear like “Survival Seed Vaults” and radiation-eliminating water bottles. But perhaps the most curious expansion of the Alex Jones brand is the line of supplements branded Infowars Life. Some of the products are merely overpriced versions of supplements you could buy at nearly any natural foods store or pharmacy in the country, wrapped in fear-mongering marketing. On the Infowars site, the pages for Infowars Life products rarely provide scientific data or studies, often citing Jones’s own stamp of approval as the only reason to purchase the product. The other sources often cited are simply links to episodes of Jones’s show, usually with his go-to science guy, the naturopath and chiropractor Dr. Edward Group. Dr. Edward Group, whose doctorate is actually in chiropractic medicine, is an alternative and holistic medical practitioner who runs the Global Healing Center. Quackwatch.com, a medical fraud watchdog site, lists the GHC in its “Questionable Organizations” list. Dr. Group has collected a number of degrees, but only in alternative medical areas and business and management programs. He also listed himself at one point as having earned a full Doctorate of Medicine from the Joseph LaFortune University School of Medicine—the same school that was sued by the Florida attorney general for defrauding nursing students who didn’t realize the university wasn’t accredited in the United States—but the degree was scrubbed from his website in mid-2015. What’s amazing about Infowars Life is how well it integrates into the greater Infowars narrative. Take the $29.99 per bottle Secret 12, for example, which is simply liquid vitamin B12. This is a vitamin that plays a key role in the human body, affecting protein metabolism as well as the formation of red blood cells. 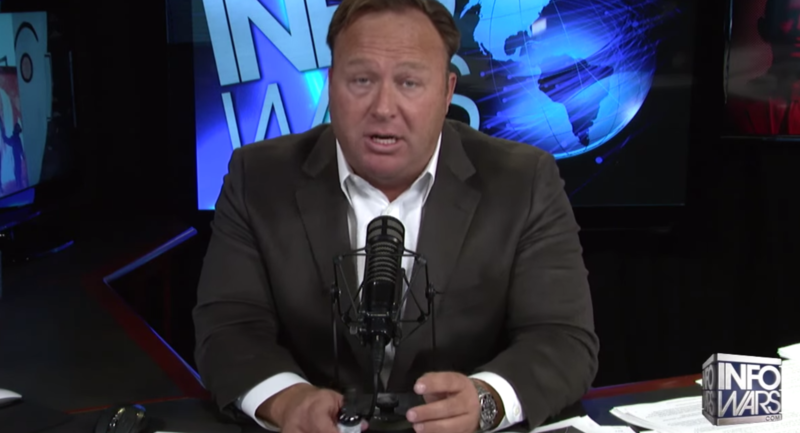 In a video from Alex Jones’ YouTube channel titled “The B12 Conspiracy,” Jones and Group explain the worldwide conspiracy that has led to a dire need for B12. “Everyone is deficient in B12,” Group says, “because of all the pesticides and everything else that’s been sprayed on the soil, 60 percent of the world’s soil is now deficient in cobalt,” an ingredient in B12 formation. Group and Jones cite a study from the Journal of Organic Systems about glyphosate, a chemical found in weed killers, causing various diseases. It mentions nothing about cobalt or B12. The two then digress into discussing the “chemical war” on America by corporations and the government: “they know what they’re doing, they’re targeting us” by foisting GMOs, fluoride, and other such chemicals on an unwitting public. The Office of Dietary Supplements says that “most people in the United States get enough vitamin B12 from the foods they eat” although anywhere from 1.5 percent to 15 percent of the population could be suffering from a vitamin deficiency, mainly due to conditions such as aging that prevent the body from absorbing B12 from food. But if you’re an Infowars fan, however, why would you trust these institutions? There was a big crackdown on the medical claims for colloidal silver when it was popular in the 1990s for treating common ailments. Jones is careful not to make any specific medical claims on the Silver Bullet product page, merely saying it’s “unique” and “has applications for both preparedness and regular use.” But it’s in his video, titled “Government Suppresses Ancient Natural Antibiotic,” that he and Group make their claims about colloidal silver. In the video, Group says that “colloidal silver “is an amazing anti-microbial compound.” The controversy around it has more to do with how the product is made, he says. “If you make it with tap water, let’s say, or if there’s any salts in the water, you can end up with silver nitrates,” which Group blames for health problems in people who have taken colloidal silver supplements. Scientists have concluded, however, that colloidal silver does not have health benefits and could be dangerous. “We emphasize the lack of established effectiveness and potential toxicity of these products,” wrote the authors of a 1996 Journal of Toxicology article. Colloidal silver can cause argyria, a condition that can turn the skin a bluish gray color due to silver granules being deposited in the skin. There was a particularly high profile case of argyria in Paul Karason, known in the media as “Papa Smurf,” who consumed a homemade colloidal silver solution after reading about it in an alternative health magazine and used a topical silver treatment on his face. In the Infowars video promoting Silver Bullet, Dr. Group says that “silver nitrates” are to blame for argyria and it was “proved” that Karason brewed his silver the wrong way and consumed far too much of it in order to turn himself blue to get media attention. Similar to Silver Bullet, another Infowars product called Survival Shield X-2 boasts a lot of claims that, in the end, don’t say much of anything at all. This product is a solution made with what Jones calls “nascent iodine.” In an Infowars video called “The Iodine Conspiracy,” Jones describes Survival Shield X-2 as a product that will “block fluoride and other members of the halogen family that are so bad for you.” Jones says that the government has been practicing “eugenics” by putting those products into the water supply, and that nascent iodine will protect you from it. Dr. Group references a holistic health book called “Iodine: why you need it, why you can’t live without it” by Dr. David Brownstein, which says nothing about nascent iodine but rather just addresses the basic, well-known role of iodine in the human body. His second reference, a book on women’s health from a Dr. Christiane Northrup, does mention nascent iodine, but only in passing and as just another way to consume iodine. Dr. Northrup makes no claims about nascent iodine being any better for women’s thyroid health than another product. She links to www.thyroidnascentiodine.com, a broken website that isn’t associated with the medical community. Dr. Northrup did not respond to a request for comment. The final reference that Dr. Group has on his nascent thyroid page is to one of the only other names that tends to be associated with the product, a Dr. Edward Sircus, the founder of the so-called “International Medical Veritas Association.” Quackwatch.com lists the IMVA under its list of questionable organizations. Not only is there no research to support nascent iodine’s supposed effectiveness or special fluoride-blocking characteristics, its supposed chemical makeup is not possible. Sonya Angelone of the Academy of Nutrition and Dietetics referred Motherboard to ConsumerLab, an independent health and nutritional product testing group, which addressed nascent iodine in this post. They note that nascent iodine, which promotes itself as being a free, unbound iodine particle rather than diluted in a solution, is impossible if it’s in liquid form. To be in a liquid supplement like most nascent iodine is sold, it would no longer be “atomic” as many of these promoters label it. “Therefore, if you are buying a supplement promoted as 'nascent iodine', it is most likely sodium iodide or potassium iodide,” she said. Iodine is undisputedly essential to a healthy, working human body. Angelone explained iodine’s role to Motherboard as “a key nutrient required by the thyroid gland. It helps convert T4, the inactive thyroid hormone, to T3 the active thyroid hormone.” Most people get iodine from iodized salt, but those that don’t may need supplements like Survival Shield X-2. But the Infowars product will have the exact same effect as most other iodine supplements on the market. Alex Jones’ chief research buddy is a chiropractor with a similar allergy to scientific data and a penchant for charisma and marketing. Survival Shield X-2 won’t save you from a nuclear holocaust, and Silver Bullet won’t magically cure your immune system. But it will pad the pockets of Alex Jones and help him scheme up new ways to scare you into paying him all over again.